Using Parentivity to learn about safe sleep is engaging and fun! Take a peek at 4 pieces on safe sleep and see how you can give your little one the perfect ending to the day. Beginning with The Triple Risk Model video, you will learn about the latest research-based theory on why some infants are impacted by SIDS. Not a scientist? No worries. The information is presented using everyday language and simple graphics. 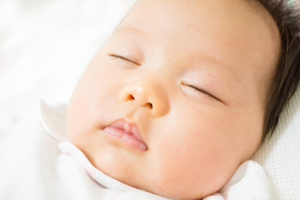 Next, Night, Night, Sleep Right shows caregivers how to reduce the risk of SIDS. This information sheet is printable, so share the facts with others offline. Post the graphic as a reminder to anyone on Team Baby, including sitters, friends, and family members. 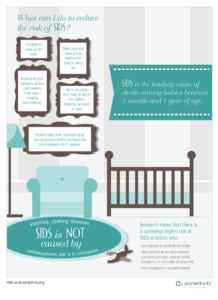 Once you have learned about what causes SIDS and how to help prevent it, test your knowledge with Bring Me A Dream. This interactive true/false quiz gives you immediate feedback on your answers. Wrap it up with a Parentivity game that requires you to make some moves. Goodnight, Love gives you the opportunity to remove or adjust items in the nursery to make the environment safer. Want to learn other ways to help baby thrive? Ask, learn, and share with members of the Parentivity community. Join us! For more information about Safe Sleep, click the image below.